Welcome to Laurie Lamberth’s Blog! Recognized as one of Connected World Magazine’s “Women of M2M”, a “Power Player in Mobile” by AlwaysOn Networks, and a “Top 100 IoT Influencer” by Onalytica Research, Laurie Lamberth leverages her 20+ years of experience in mobile, IoT/M2M and ad:tech to help businesses capitalize on these mega-trends and profitably launch and grow their businesses. Laurie’s management experience and proven results in business development, marketing, finance, I.T., and operations within small companies, start-ups and Fortune 250 corporations give her the insight and skills needed to help companies discover and exploit new revenue opportunities, streamline and automate customer service and operations, and develop best-in-class partnerships covering both technology and business/corporate development. Laurie is currently serving full-time as VP, Operations for ad:tech startup Bulzī Media, having put her role as Associate Partner for 151 Advisors her this long-term consulting client launch their addressable out-of-home (OOH) digital ad network. 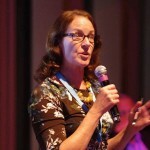 Laurie wrote a column for Connected World Magazine for five years, as well as contributing to numerous other technology magazines and blogs. Check out her Archive link above for summaries of Laurie’s work and links to articles that are available online. Until recently, Laurie was an active speaker on the IoT/M2M and ad:tech conference circuit. These activities have taken a back seat to Laurie’s start-up leadership role with Bulzī Media. Prior to her work in wireless and ad:tech, Laurie exploited her B.S. in Accounting from Cal State Long Beach and MBA from UCLA with roles in Finance and I.T. at Xerox, Deloitte & Touche, Rockwell International and Allergan. She is a Certified Management Accountant and California CPA (both inactive) and has extended her education with workshops in strategic negotiation and leadership at the Harvard Business School. Laurie lives and works in Arvada, CO.